Delacorte Books for Young Readers, 9780553536744, 352pp. 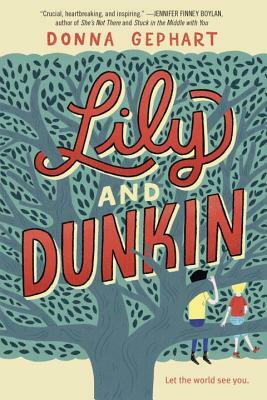 For readers who enjoyed Wonder and Counting by 7's, award-winning author Donna Gephart crafts a compelling dual narrative about two remarkable young people: Lily, a transgender girl, and Dunkin, a boy dealing with bipolar disorder. Their powerful story will shred your heart, then stitch it back together with kindness, humor, bravery, and love. Donna Gephart’s award-winning novels are packed with humor and heart. They include Death by Toilet Paper; Olivia Bean, Trivia Queen; How to Survive Middle-School; and As if Being 12-3/4 Isn’t Bad Enough, My Mother Is Running for President! Donna is a popular speaker at schools, conferences, and book festivals. For reading guides, resources, writing tips, and more, visit donnagephart.com. A transgender person is someone who does not identify with the biological gender assigned to him or her at birth. Lily, born Tim, associates as a female and wants to start the hormone therapy that will allow her to begin the physical transition to become a girl. When did Lily begin to think of herself as a girl? Why is it best that she begin the hormone therapy now? Her mother and sister are very supportive, but her father is not. Discuss why her father is resistant. How is Lily’s father finally convinced to support her decision? Throughout the book, members of Lily’s family and her close friend tell her how brave she is. How does Lily exhibit this bravery when she stands up to the city in an attempt to save the tree she has named Bob? Why is the tree especially important to her as she takes bigger steps toward becoming Lily? What is her ultimate act of bravery? Norbert suffers from bipolar disorder, a mood disorder that causes extreme lows and extreme highs. The proper medication can control his mood swings. Why does he think stopping the medication will help him on the basketball court? Why does his mother suspect that he isn’t taking his medication? Who is Phin? Why is Norbert’s mother so concerned when he talks to Phin? Lily is one of the first people Norbert meets when he moves to Florida. Why does Lily nickname Norbert “Dunkin”? Why is Lily so disappointed when Dunkin wants to sit with the basketball team at lunch? Cite evidence that Dunkin is uncomfortable when the basketball players call Lily names like “fag” or bully her in the hallways. Both characters are bullied because they don’t fit in with their classmates. Why are they hesitant to report the bullying to school officials? How might schools intervene to help students like Lily and Dunkin? Discuss the enormous courage it takes for Lily and Dunkin to share their secrets. How does their acceptance of one another affect the way they act throughout the rest of the novel? It won’t be an easy road for either of them. What are some of the obstacles they are likely to face in the future? How is this book about tolerance and understanding?